The types of scaphoid fracture treatment differ mainly due to the various stages of severity in which these injuries can present. What works for a non-displaced fracture may not work for a more severe, displaced or late-diagnosed injury. In this section we’ll touch upon a few of the most common treatments for this injury. Let it be said here that the general consensus of opinion is that, even if a scaphoid fracture cannot be readily seen and verified on x-ray examination, if it is strongly suspected, then some level of treatment should be undertaken, even if it is pro-active. 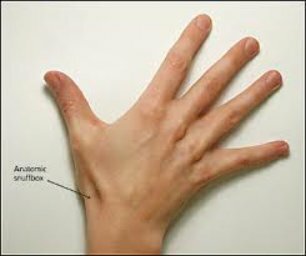 Casting options for scaphoid fracture treatment must address the concept of reducing or eliminating unnecessary motion at the fracture site, because major tendon structures that operate the thumb and the index finger pass over the “anatomic snuff box” and can be responsible for considerable “micro-motion” at the site of the break; just enough to interfere with healing. Therefore, in many instances, casts must be applied that will restrict motion of the thumb, index finger and occasionally, the long finger. In the case of cast immobilization, the casting material is wrapped around the selected digits to immobilize them, thus preventing unwanted motion of the scaphoid carpal bone. More specifically, the thumb is incorporated into the overall cast design and is the only digit immobilized in addition to the wrist and forearm. The thumb spica cast is considered to be the least effective casting option for any scaphoid injury beyond the “hairline” crack, non-displaced variety. This is mainly due to the fact that only the thumb is immobilized, and the motion caused by the use of the index and long fingers is not eliminated. This casting variety was popularized in the 1960’s by orthopedic surgeon; Ernst Dehne M.D. who developed the cast to address the micro-motion caused by active usage of the tendons that operate the thumb, index and long fingers in the area of the anatomic “snuff box”. The cast, typically a short arm version that extends up the forearm to just below the elbow, incorporates the thumb, index and long fingers in their normal “position of function” (almost in a grasping position). It can be made of plaster or fiberglass. 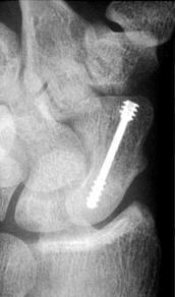 What initially began decades ago as a simple insertion of a smooth pin to stabilize the scaphoid fracture components has evolved to various forms of fixation devices. One such device is called the Herbert or Herbert/Whipple screw. These screws are typically headless and constructed with threads of two different “pitches” or thread angles which, when screwed into place, help to compress the two fragments together for optimum healing. Surgical fixation is often accompanied by the use of some kind of bone graft substance, as there is the risk of post injury bone death due to avascular necrosis (loss of blood supply). Ideally, bone is taken (harvested) from a remote location on the patient, such as the hip crest. This tends to work better than fresh-frozen or synthetic alternatives, although there are many good ones out there today.